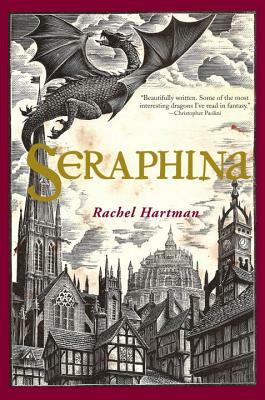 Seraphina by Rachel Hartman. Grades 7+. Random House Books for Young Readers, July 2012. 467 pages. Review copy provided by my local library. In a world where dragonkind can take human form and the dragons have an uneasy peace with humans due to a treaty signed many years ago, Seraphina is an abomination. She's half-dragon on her mother's side. Scales twist up her arm and around her waist, something she's never let anyone outside the family see. If anyone knew, it would be almost certain death for her and for her father who unwittingly broke the law by marrying a dragon. She's taken a job as assistant to the court composer and fills her days with music, although she almost never lets herself perform. Her virtuoso musical talents would bring too much attention upon her, and Seraphina prefers to hide in shadows where it's safe. As the entire court prepares for a visit from the leader of the dragons, tensions rise in the city where some humans believe that peace with the dragons is impossible. Seraphina, caught between two races, may be the one being who can save them all. I picked up Seraphina because there was a lot of buzz building about it and I wasn't disappointed with this most impressive debut. The world that Rachel Hartman builds is richly imagined and intricately built. Her rich descriptions allowed me to build the palace and city in my mind and populate them with the characters of her story. It's an utterly believable fantasy tale, rife with political tension and courtly intrigue. Seraphina herself was a great underdog character. Hiding from the world, she does what she can to get by. She never allows herself to think that she might actually find happiness in this life, only that she might survive it. Music is the one thing that truly gives her happiness... until she meets Prince Lucian Kiggs, a man utterly unattainable. Even if Seraphina wasn't a half-dragon abomination, Prince Lucian is betrothed to Seraphina's music student, Princess Glisselda. The story's told in first person from Seraphina's point of view and she has a wry wit that made the story a pleasure to read. She deftly weaves the history of her land and the treaty and the dragons into her narrative. The language is rich and lends itself well to this fantasy world. This is one of those books that unfolds in its own time, mostly with great success. I did think the politics bogged down the book a little bit in the middle, but the ending more than made up for it. This is a book that wraps up nicely, while still leaving enough of a teaser to have me looking forward to a sequel. I would definitely hand this to fans of richly imagined fantasy, particularly Graceling (and its companion books) by Kristin Cashore, with their emphasis on politics. You can read a short prequel to Seraphina on GoodReads: The Audition. Read more reviews at Book Nut, Confessions of a Bibliovore, Parenthetical, and Steph Su Reads. Seraphina is on shelves now!